Quarterly meetings on the 3rd Saturday of the month. 9:30 a.m. mini-workshop of Hawaiian cultural or historic significance, followed by business matters. Nohona Hawaiʿi, and its earlier version, the Hawaiian Committee, have a long history. Dozens of ordained priests have served in this Cathedral since the establishment of the Anglican faith in Hawaiʿi in 1862, though few have been of Native Hawaiian Ancestry. These included Queen Emma’s personal chaplain, Reverend William Ho‘opili Ka‘auwai. 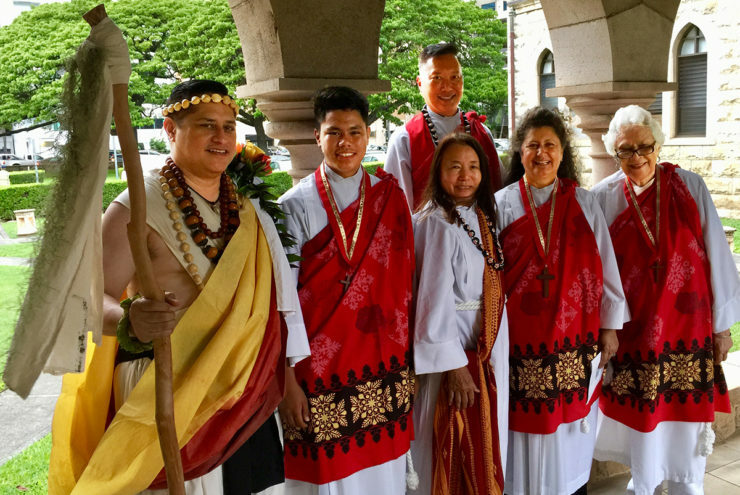 Then it took another ninety years before another minister of Hawaiian Ancestry was ordained: The Right Reverend Edwin Lani Hanchett was ordained a deacon, then a minister, then a bishop. Bishop Kennedy, who served in the mid-twentieth century, focused on raising up six priests of Native Hawaiian ancestry and six priests with “local” identity. He was not doing this for empowerment of indigenous peoples, but to stabilize the clergy of the Diocese. It was too expensive and disruptive to bring in priests from the mainland who stayed a few years before returning to the mainland. So what is the matter with bringing in priests from the mainland? They are certainly well trained in seminary. However, they do not understand our unique Hawaiian experience, sometimes making it difficult for the parishioners to relate to them. For many decades, a Hawaiian Committee would be organized whenever there was an “issue” about how to run the Hawaiian service. Mahie Brown would chair it, or Malcolm Chun, or later Aunty Pat Trask. The Hawaiian Committee ran intermittently as needed for years, until Dean Ann McElligott arrived in 2002 and asked Paulie Jennings to Chair the Committee about 2003. Since the title “Hawaiian Committee” never sounded very Hawaiian, Roth Puahala, our Senior Warden and Head Verger, suggested the term “Nohona Hawaiʿi” which means “of things Hawaiian,” and that sounded better. Kilani Ventura formulated our Mission Statement: Keeping Hawaiian cultural heritage alive for the Cathedral of St. Andrew. The Hawaiian Committee’s former purpose of guiding the clergy or defending Hawaiian traditions is no longer an issue. Our Diocese now has its own seminary. Our Priest in Charge considers his cultural identity to be “local”. Our assisting priest was raised within the Hawaiian culture. Head Verger Roth Puahala is a kumu hula who specializes in protocol. If there is any question about how our services should be presented, we just ask Roth or talk it over at the Worship Committee. Our Hawaiian services are rich in Hawaiian language and authenticity.